Perfect Location In The Middle Of The Golden Triangle Of Ski Country! Seconds from the Appalachian Trailhead. This spacious, warm, woodsy, modern mountain retreat with a hot tub is in the heart of the Green Mountain Forest and close to Manchester shopping, Dorset, Quarry, Stratton Mountain, seconds to Bromley, Drive to Magic, Killington, Mount Snow, Okemo, The Hermitage, Orvis and so many more activities. Great for two families or a large group. Fully-stocked smart home has it all. 5-star rated! Vast Mountain scenes surround this 3 bedroom smart home. Sleeps 8 plus. Minutes to Stratton, Bromley, Manchester Designer Outlets, Dorset Summer Equestrian festival, Appalachian trail hiking, waterfall jumping at the famed Dorset Quarry as seen on the Travel Channel with quarry swimming and diving, fishing at The Equinox and Taking the Land Rover Off Road adventure series. The warm and woodsy retro-modern interior soothe the body and soul after a long winter of hard work. The unique layout of this home puts distance between the bedrooms for privacy but keeps the conversation going with its open living floor plan. The open air hot tub is a perfect way to relax next to the fire pit and BBQ. For those wanting a little time on their own, the second recreation area is a cozy respite with its own fireplace, wet bar and smart TV. There are 3 bedrooms: 1 master bedroom with heated queen bed and ensuite full bath, 1 second bedroom with 2 heated twin beds that can be combined as a king, with a full bathroom adjacent the bedroom door as a mini suite. A 3rd bunk room with 4 twin bunk beds and full bath just outside the bedroom door. Heated feather beds, down comforters and down pillows provide a luxurious nights sleep! There are noise canceling curtains in the main bedrooms and a spa-like sleep machine to sooth you to sleep with white noise for those who have trouble falling asleep. Wake up to free gourmet coffee and hot chocolate before you jump into the shower with Neutrogena and TRESemmé bath products provided. Go play at any of the numerous mountain resorts within a 5 to 30 minute drive and come back to a roaring fire in any of the 2 fireplaces or the outdoor fire pit. Grab your cocktail and swim suit then submerge yourself into the open air hot tub with a friend and compare your life stories or discuss your savvy purchases from the designer outlets in Manchester down the hill. Or, do a quick change and hit the many acclaimed restaurants just minutes away. This house is well equipped for your stay with bedding, towels, hair dryer, coffee, etc. Forgot a toothbrush? It is there. Need cough drops? They are there. No need to chase down a property manager at midnight to get your key, the door and security system is programmed with your own personal key code. Simply arrive and punch in your code to enter a home that has been prepared and ready for your enjoyment. Please email me a 4 digit code you can easily remember, it will be used to unlock the door and control the alarm. In addition you have the choice to have the second bedroom arranged with 2 twin beds or one king bed, if you have a preference please let me know when you book. Email me for an entire home usage packet with information to help you enjoy the home and its amenities. I am available 24/7 for any needs. Call me at (PHONE NUMBER HIDDEN) or if I am unreachable call my housekeeper Dana at (PHONE NUMBER HIDDEN) I will be located 4 hours away and will not disturb your stay by stopping by. However I will be checking in via text message and will be available if you need anything. The house is conveniently located just off of route 30 for easy access on snowy days. You will likely want to use the upper driveway of the two available and enter through the front door at the end of the bridge. There are noise canceling curtains in the main bedrooms to minimize any sounds for sleeping. You can ensure a quiet night by making sure the windows are both shut and locked, and for a more peaceful sleep, you can draw the drapes. The birds wake up at sunrise but you may not want to. You indicated we needed to provide a 4-digit code to enter this house, which will be programed before we get there. What happens if the code doesn’t work? YOUR CODE SHOULD BE ACTIVE BY YOUR ARRIVAL IF FOR SOME REASON YOUR CODE DOESN'T WORK OR THE POWER IS DOWN THE LOCKBOX ATTACHED TO THE DOOR FRAME (AT SHOULDER HEIGHT) CONTAINS A KEY, CALL ME FOR THE CODE. YOU MAY USE THE KEY TO ENTER BUT PLEASE LEAVE IT ATTACHED TO THE TETHER AND LOCK IT BACK UP AFTER YOUR USE. What kitchen supplies are included? THE KITCHEN IS FULLY STOCKED WITH THE NON-EDIBLE STAPLES. YOU WILL HAVE, POTS, PANS, BLENDER, BRITTA, COFFEE MAKER, UTENSILS, KNIVES, CAN OPENER, TOASTER, FOOD PROCESSOR, ETC. COFFEE PODS FOR THE KEURIG MACHINE ARE PROVIDED FOR YOU. YOU WILL WANT TO BRING FRESH CREAM OR MILK, AS WELL AS ALL YOUR FOOD AND DRINK. ALL BEDDING IS PROVIDED FOR 8 GUESTS STANDARD, AN ADDITIONAL QUEEN SIZE AIR MATTRESS WITH ALL LINENS CAN BE USED FOR A FEE AND IS LOCATED IN THE MASTER BEDROOM LEFT CLOSET. SIMPLY BREAK THE SECURITY TIE AND PLUG IN THE SELF-INFLATING MATTRESS. THERE ARE NEW LINENS AND PILLOWS THROUGHOUT THE HOUSE. THE UPSTAIRS BEDS HAVE DOWN PILLOWS, MATTRESS TOPPERS, AND DUVETS. THE UPSTAIRS BEDS ALSO FEATURE BED WARMERS FOR A COZY NIGHT'S SLEEP. What supplies come in the bathrooms? BATHROOMS ARE SUPPLIED WITH SHOWER GEL, SHAMPOO, TOILET PAPER, HAIR DRYER, AND TOWELS. What if I forgot something? IF YOU SHOULD FORGET SOMETHING, THERE IS A COLLECTION OF CONVENIENCE ITEMS AVAILABLE FOR PURCHASE, IT IS ON AN HONOR SYSTEM AND YOU PAY WHAT YOU THINK IS A FAIR PRICE. THERE ARE TOOTHBRUSHES, DEODORANT, RAZORS, HAND WARMERS, LIP BALM, ETC. You mention fireplaces, is wood provided? YES, WOOD IS PROVIDED FOR YOUR USE IN THE WOOD BOX NEXT TO THE FIREPLACE, THIS SHOULD BE ENOUGH FOR YOUR ENTIRE STAY. ADDITIONAL WOOD WILL BE AVAILABLE FOR PURCHASE SHOULD YOU RUN LOW. IT SELLS FOR $50 PER LOAD. NOTIFY ME IF YOU NEED MORE AND I WILL ARRANGE FOR IT TO BE DELIVERED AND STACKED. THE LOWER FIREPLACE IS PROPANE AND DOES NOT REQUIRE WOOD. PROPANE IS PROVIDED FOR YOU. Where is the closest store? THERE IS A SHOP JUST UP THE HILL PAST BROMLEY MOUNTAIN ON THE LEFT WHICH SELLS MOST THINGS YOU MAY NEED INCLUDING FOOD, GAS, AND LIQUOR. TURN LEFT ONTO THE MAIN ROAD AND DRIVE ABOUT 3 MILES. Linens are all matching and freshly cleaned and pressed for your stay. there is plenty of parking for 4-6 cars up top and 2 cars below. comfortable living room with a wall of natural light and views of the mountain woods across the room from the wood burning fireplace, wood provided. This room has a large home theater system. Full size refrigerator will be completely empty for you use. Electric cooktop gets very hot for searing. Also, very controllable for simmering. There is a standard K-Cup coffee maker with a variety of coffee to chose from. There is also a combination espresso machine and traditional full coffee pot. Espresso beans are not supplied. some spices. There is also a tray of sundries in case you forget a razor, handwarmers, medicines, snacks, etc. You pay what you think it is worth into the lockbox. Fully functional kitchen with electric appliances, table settings for 12, pots and pans, blender, toaster, microwave, food processor and more. There is free coffee in the form of K-Cups. There are Samsung Smart televisions in every room in the house. They are pre-programmed with Netflix, Hulu, Pandora and a large number of other apps for your entertainment. There is a home theater upstairs, separate audio system for the hot tub and a subwoofer in the basement for effect. There are traditional board games located next to the dining table in the cabinet. There is also a dart board located in the family room down the spiral staircase. There are a few kids toys in the closet in the bunk room. The Family room has a giant flat screen tv with Apple tv and Playstation 2 connected with a full library of games. wood deck for cooking, dining, and hot tubbing. There are 5 mountains within 35 minutes some as close as 5 minutes. There is a bridge from the driveway about 48 inches wide. It allows direct entry to the house from the driveway protected with railings. Once inside the entire upstairs is accessible by wheel chair including the kitchen, so long as the wheel chair will fit through a normal house door. Hot tub for 5 guests. House was comfortable and well appointed. Would definitely stay again. 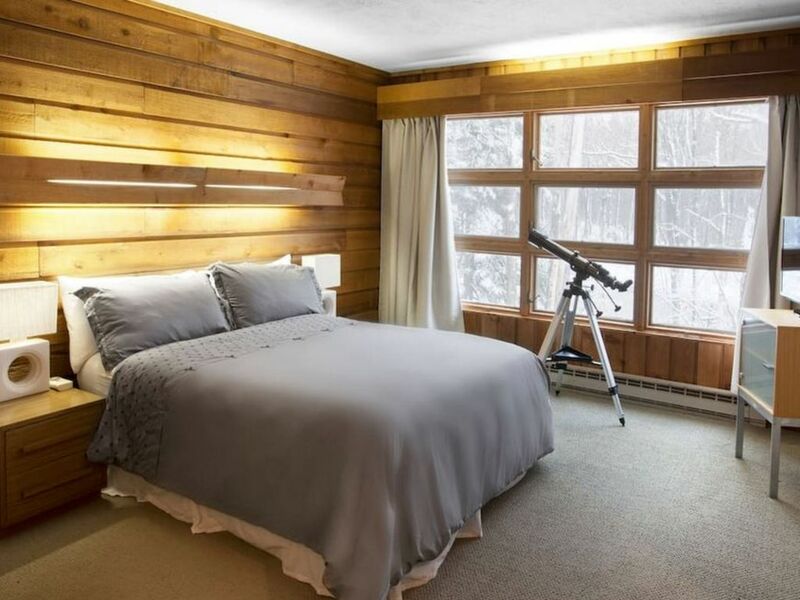 The place has everything you need for a relaxing trip to the mountains during ski season. Convenient location to both Stratton and Bromley. Also convenient to Manchester Center. Hosts were great throughout. Strongly recommend. This home has everything you would want in a ski vacation home. It is set up for rentals with new clean bedding and bath linens, new kitchen pots and pans as well as silverware and place settings. It is managed like a rental villa, not at all like you are staying in someone's home. The experience is like you are in your own home, the closets and drawers are all yours, you don't have to step around the owner's items everywhere. It is nicely decorated, has smart features all around, including security system, electronic door lock and smart entertaining tv's. Loved the free firewood, super clean hot tub, extra towels, etc. The house was warm, including the bed warmers, and super clean. Will be taking the family back this summer to enjoy the Dorset quarry and horse show. And of course will be back next winter too. LOVED IT. Wonderful Home with a very attentive Host! My family of 8 stayed at this home during President's Week Vacation. The house is in a very convenient location , a 5 min drive to Manchester for shopping and dining. We loved the location for skiing. It is 5 mins to Bromley, 15 mins to Stratton and 30 mins to Okemo. The layout of the house was perfect for our group. The kids enjoyed the lower level bunkroom and the adults greatly appreciated the comfy beds and high end linens. The fireplace in the family room was perfect for our snowy nights. Follow that up with soaking our tired bodies in the outdoor hot tub! Chris is a great home owner to work with. He answered all of questions during the booking process, and was available at all times for questions during the trip. Our kids loved the place so much, they want to go back soon! Do not hesitate to book this rental. You will be happy you did! Thank you Jill, it was a pleasure to have you and your family. We would love to have you back any time. Summer is great up in Vermont and so close, with mountain breezes and a plethora of activities to engage in.